Upperville Colt and Pony Show | Chronicles of a "Mini-Pro"
When we were kids in school, most of us were told to keep our eyes on our own papers. Ostensibly, this was a punitive measure for not studying, designed to prevent us from getting a leg up from the students around us who we perceived to be smarter than ourselves or more likely to have the correct answer. However, it is quite often the case that we in fact do know the right answer, and keeping our eyes on our own papers is a means to demonstrate our own skills, knowledge and strengths. I have long struggled with feeling insecure about my riding, probably because it is the one thing above almost anything else which is tied to my self-identity. Riding is a humbling sport, in so many ways. How many times have we equestrians said that horses are our best teachers? Every single day, we can learn new things about ourselves, our own horses, and about horses in general, if only we are willing and able to listen. But sometimes our eyes stray, and we take in the movement of another horse, the skills of another rider, the amenities of a different facility, and we begin to doubt the value of what we have in front of us. 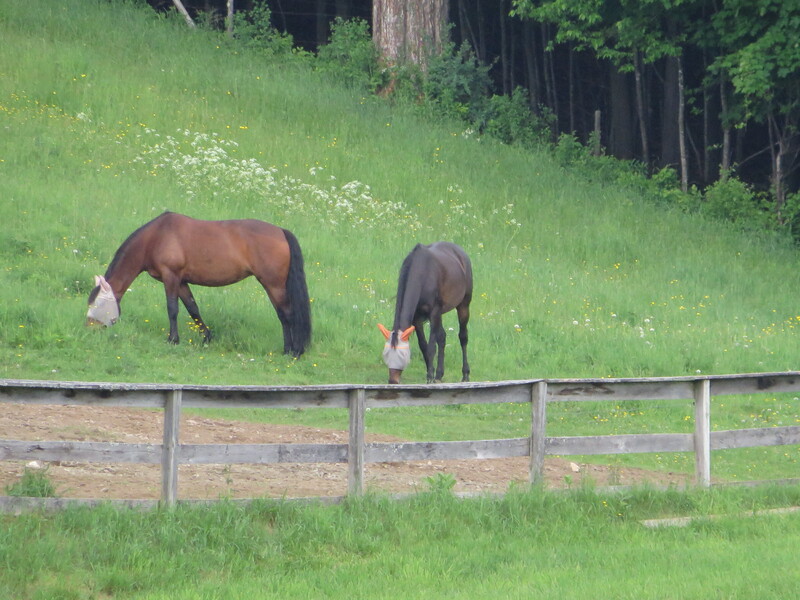 Annapony and Dark Mare (Lee) at Tamarack Hill Farm last summer. This happens to me all the time. But I am slowly learning the value and technique of riding your own ride. This spring has been a time of real growth for the dark mare, Lee. As we progress towards our season’s goal of completing the three day 100 mile ride at GMHA in early September, I have been gradually stepping up her competitive distances. This May, we rode our first one day thirty mile ride. 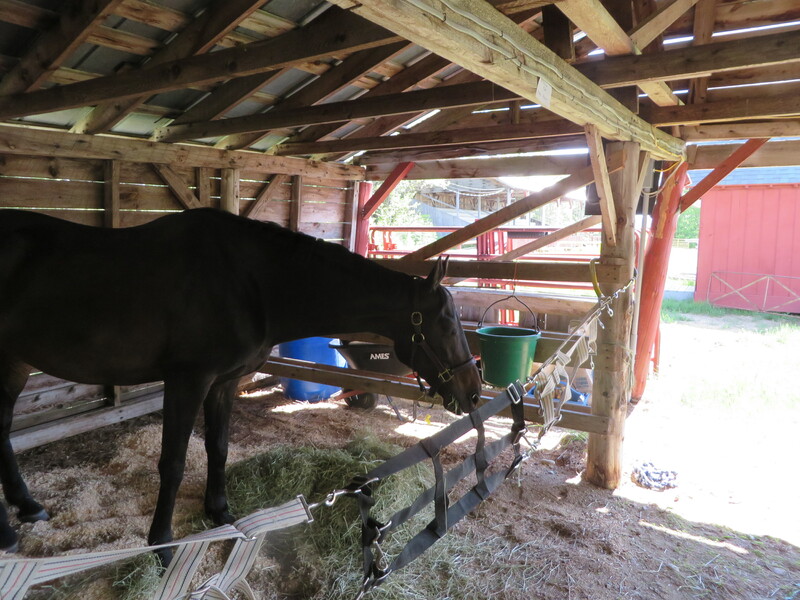 It was full of new adventures—we had to camp the night before, with Lee spending the night in a three sided cow stall at a fairground in rural Maine, while I slept in my horse trailer (the part the horse rides in, not a tack room or LQ). We didn’t know anyone there, but the other riders and organizer went out of their way to be helpful and friendly to the rookie rider and horse. The morning of the ride was cold, in the thirties, and as I hand grazed Lee before the ride started she was leaping about at the end of the line. I am sure that some who witnessed her behavior wondered how the rookies were going to fare that day. Lee enjoyed the cow-free cow barn in Maine. We rode out with another rider, a gentleman on a lovely Dutch Harness Horse who was doing day one of the three day eighty mile ride. Lee has overall gotten much better about going out on her own, but has a hard time leaving other horses if they are around. So for the first several miles, we stuck with the gray gelding and his veteran rider. As both horses began to loosen up and get moving forward, they seemed to be staying at a steady pace consistent with the training rides I had been doing with Lee. The terrain on this ride was mostly flat, which meant that it was easy to sort of just motor along. This rider told me that he had more recently been doing endurance competitions (which is essentially a race) and so was needing to readjust his sense of pace to suit competitive trail, which requires riders to finish within a set window, neither too slow or too fast. He used a combination of trot and canter, and for a while I kept pace with him. But then I looked at my watch, and I realized we were averaging five minute miles. I knew that this was not a pace that Lee could sustain, nor was it necessary to do so to finish the ride on time. So I gradually held Lee back, allowing the gray horse to push further and further ahead, eventually leaving our field of vision altogether. For the first time in her competitive trail career, Lee and I were riding alone. 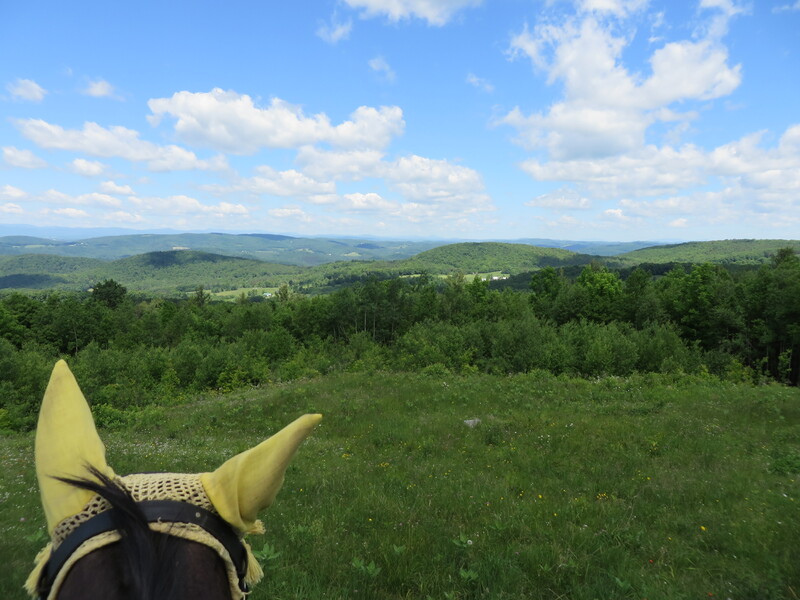 Between the ears– riding Lee in Vermont summer of 2014. Without a friend to lead her, Lee was a little less confident, spooking or shying more than usual, but she gradually settled into her own rhythm and continued steadily forward. We continued like this for nearly ten miles, and as we traveled along, I reflected on the truth of needing to do what is right for your own horse. 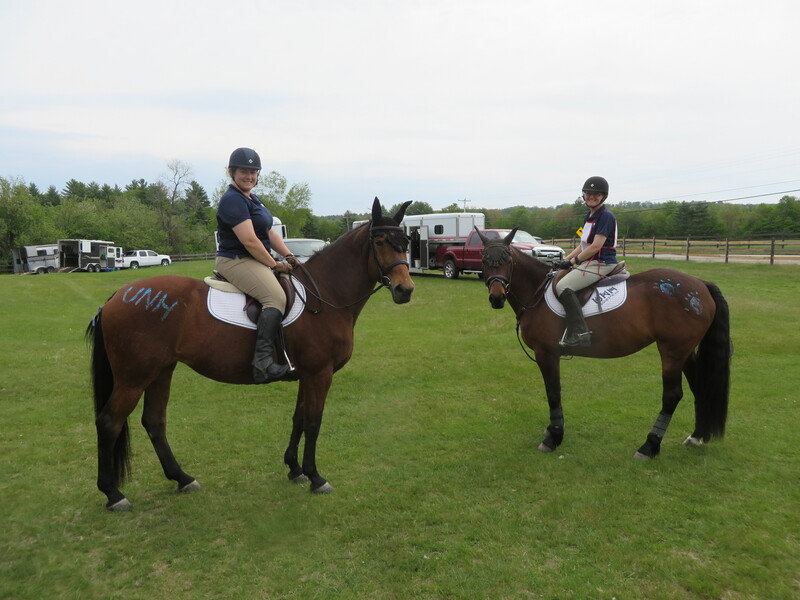 In endurance riding, the tag line is, “to finish is to win”, and experienced riders talk about the importance of building a horse up for years before they get to the level of strength and experience that they can actually race and attempt to win at rides. Competitive trail is assessed by more subjective criteria than endurance, but the overarching theme is that your horse must be well taken care of before, during and after the ride if you are going to achieve a good result. That means that you, the rider, must make good choices for your horse in terms of when and how hard you push them onwards, which requires that you have an excellent awareness of both their fitness level and condition as well as how they are handling the ride that day. Lee and I caught up to other riders at the half way hold, including our friend on the gray. She quickly pulsed down to recovery criteria and continued on in good form. But I don’t think this would have been the case if I had tried to keep up with the other horse. It wasn’t a question of his horse being ‘better’ than mine, or he being a savvier rider. She simply wasn’t as fit as he was, because the two horses are currently on different training paths. The gray horse’s pace was inappropriate for Lee. It was important for me to stick to what I knew was right for my own horse, and to ride my own ride. Lee went on to win the Maine 30 CTR with a perfect score of 100. This June, I had the amazing opportunity to officiate in the Connemara division at the Upperville Colt and Pony Show, held in the heart of Virginia horse country. This year was the 162nd anniversary of the show, and my first time officiating as a licensed USEF judge. No big deal—just one of the most prestigious “AA” shows in the country, and the largest sanctioned Connemara division. I admit I was nervous to be a part of such a cultured history in horse showing. The show grounds are incredible, and overall the quality of the horses there matches the atmosphere. 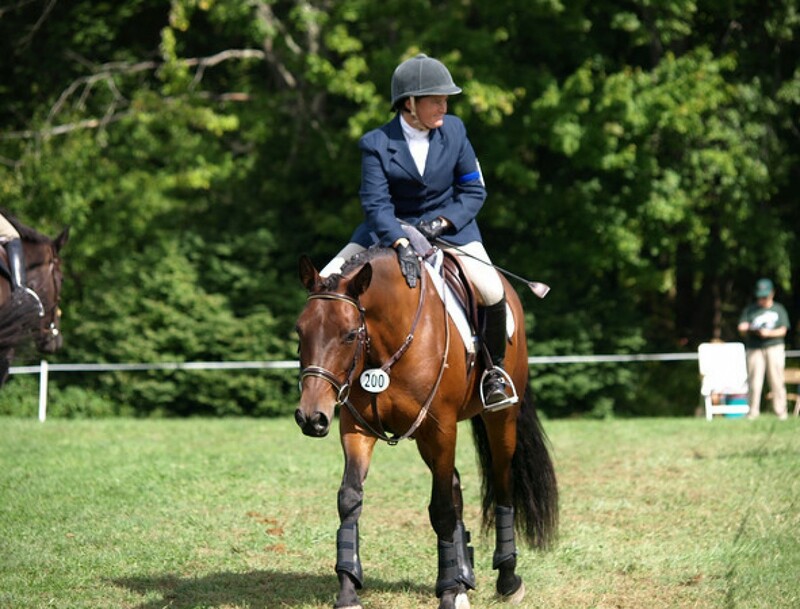 One doesn’t bring the average workaday hunter to compete at Upperville. This is a land of quality breeding, high end care and all the accoutrements that go along with it. There are classes running on both sides of the street, countless vendors, spectators everywhere and golf carts galore. The evenings each feature some sort of marquee class, one night a grand prix, the next a $25,000 Hunter Derby. Ringside parties are attended by richly dressed members of the social elite; the old money just oozes off of them, in the most non ostentatious way possible. I am confident that the amount that most competitors spent on their week of showing would send a family of four on a decent vacation. It would be so easy to become jealous of the riders there, to long for a pair of their custom field boots (made by someone whose name I can’t pronounce), to covet their high end tack, their amazing, highly trained jumper (the one who TOTALLY ignored their cues to leave a stride out at the combination and who instead smartly touched their feet down just so and carried that rider straight into the jump off). But instead, I am learning to ride my own ride. Instead of getting overwhelmed by the sheer affluence of the horse show, I found myself able to look at it with new perspective. We can spend our time bemoaning the “things” or the assets which we haven’t got, or we can spend that same life energy focused on using our resources to their best advantage. 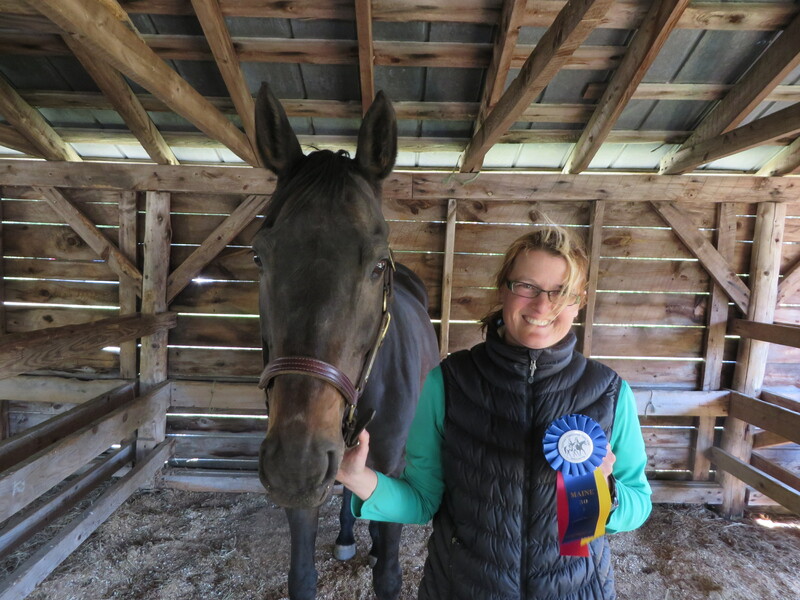 My pocket book may not be anywhere near as deep as that of the average Upperville competitor, but that doesn’t mean that I am not making steady progress towards my own goals. Being a successful rider means different things to different people, and for me, my own success is not dictated by the caliber of the competition which I am able to afford to attend. We each have to set those goals which make the most sense given our unique set of variables. We need to know which goals are most important to us, and by identifying the destinations which matter the most, we can better prioritize whatever resources we have at our disposal towards reaching that goal. Finally, I have a sneaking feeling that there are people who I know, who I am friends with on Facebook, who I see out and about, who are looking at me and saying, “gee, I wish I had what Chris has…she is really living the dream”. I have two horses, a truck and trailer, a great job which allows me the freedom to pursue some of my own equestrian goals as well as the opportunity to be doing “horse things” for my paid work. I appreciate how truly fortunate I have been to get to where I have gotten to, with the support of so many friends and family members that I couldn’t even begin to name names. Sometimes I wasn’t as grateful to them as I should have been, for which I am sorry but I am trying to be better. And I am trying to be better about keeping in perspective the fact that there are aspiring riders who would love to be standing in my shoes. So the next time you find yourself saying, “if only…” stop and ask yourself instead why you think that what the other person has or is doing is better than you. Consider if the answers you have put down on your own paper are, in fact, valid and correct for you.